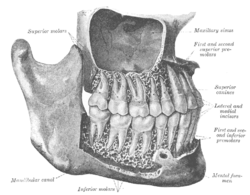 The permanent teeth, viewed frae the richt. Permanent teeth o richt hauf o lawer dental arch, seen frae abuin. 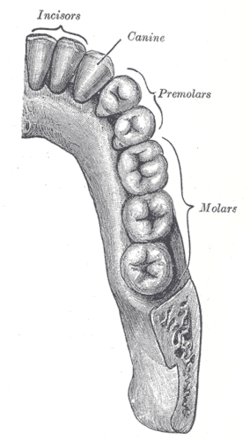 The premolar teeth, or bicuspids, are transeetional teeth locatit atween the canine an molar teeth. This page wis last eeditit on 1 Dizember 2015, at 00:27.